The SS Succes is furbished in the style of the luxurious passenger ships of the early 20th century, with leather sofas, teak, copper, crystal and many art deco details. Sailing in style is our motto. 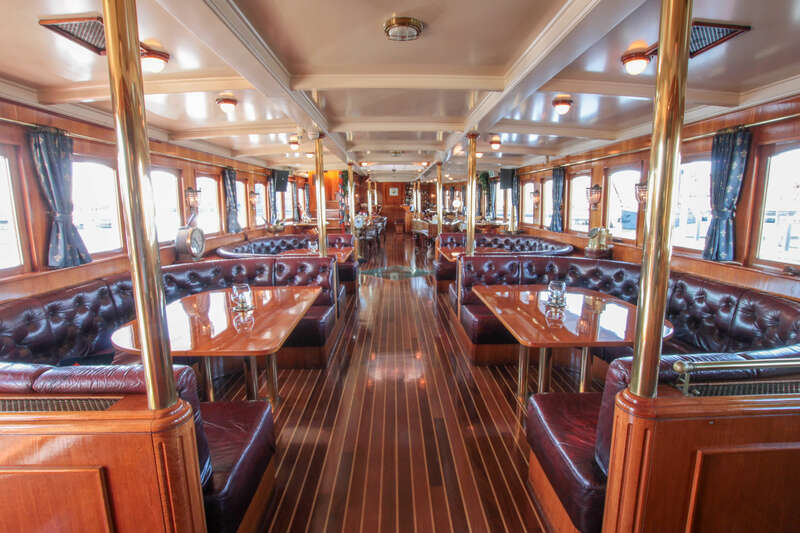 The steamer has two classic salons and offers space for up to 110 guests. 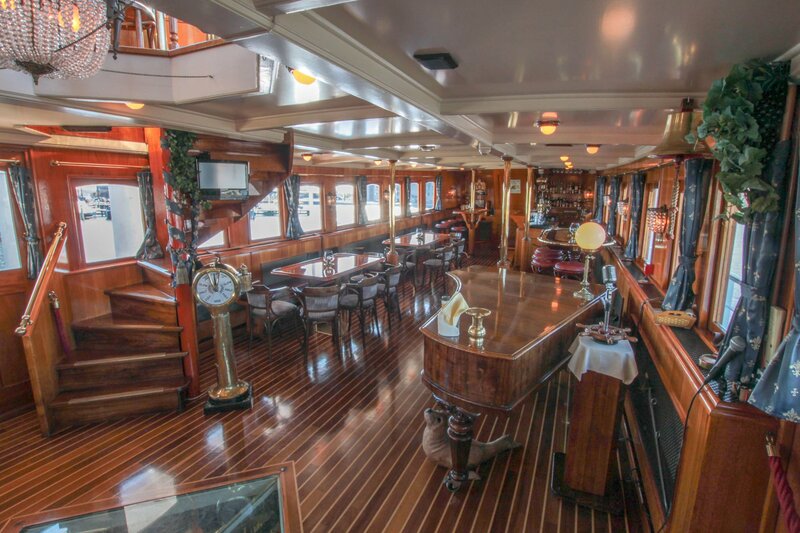 The intimate upper salon has a leather oval sofa with captain’s table and a private bar. Around 40 people can enjoy the wonderful views here. In fine weather there are ample benches outside on the sun deck. The salon downstairs seats up to 70 people and has a spacious bar and a dance floor. Also here, large windows provide a fantastic panorama view of the surroundings. The kitchen, cloakroom and toilets are also situated on this deck. 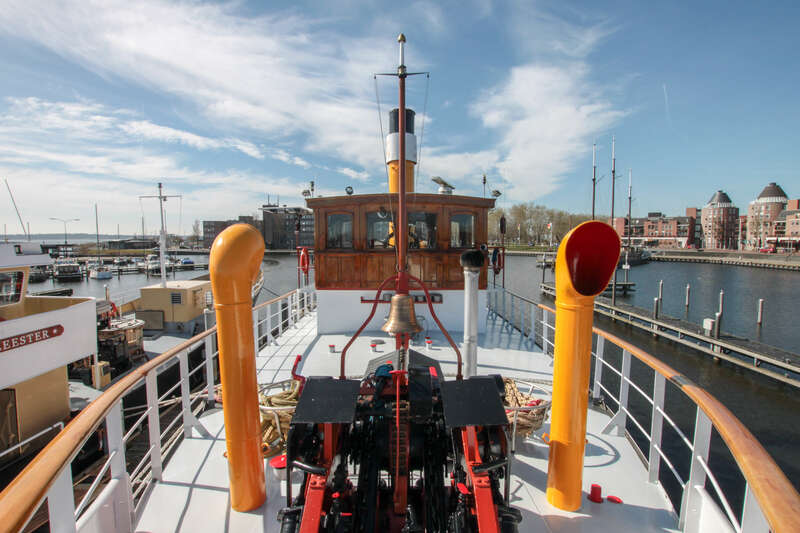 In addition to the nostalgic interior and the authentic machinery for a real steam voyage, this beautiful steamer is also equipped with a diesel engine, bow thruster, power generators, modern navigation aids, central heating and air conditioning. You can be assured that you can safely and comfortably ‘ blow off steam’ in all seasons and in all weather conditions! The SS Succes is also well-equipped for parties, presentations and training sessions. This includes a sound system with microphones, a computer with tens of thousands of titles from all music genres and audio visual resources such as a beamer projector with screen. There is even an antique grand piano! Décor and comfort make the SS Succes the party ship for every event. A wedding, corporate event, birthday or anniversary, your celebration or event is in good hands with us. The kitchen staff will happily spoil you with catering tailored to your wishes, ranging from a simple lunch, drinks and snacks/finger food to cake with champagne and a full three-course dinner. 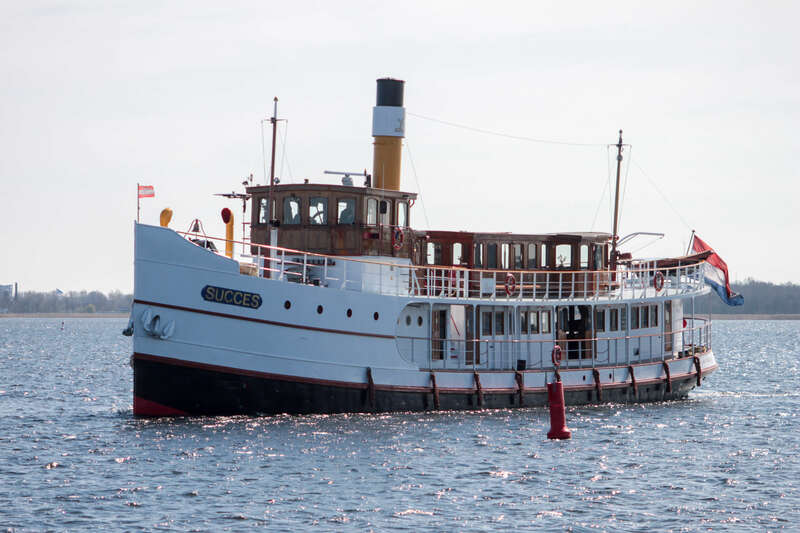 With her nostalgic and romantic appearance the SS Succes is also the perfect backdrop for television and film recordings. Furthermore the ship can serve as a mobile showroom for your product presentations. The recognizable sound of the ‘Calliope’, Europe’s largest steam organ, makes sure that the SS Succes is the crowd-puller at every event. 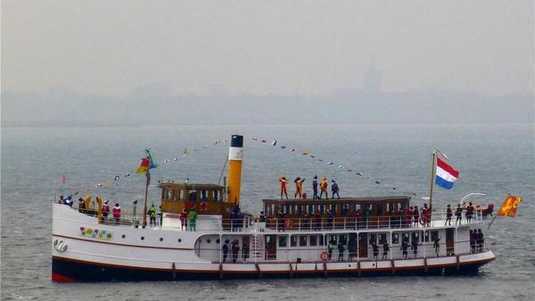 In her long existence, the SS Succes has served as the “Pakjesboot” of Saint Nicholas on numerous occasions. National fame came in 1993, when she arrived in all her glory in the harbour of Ravenstein in the south of Holland. Since then there have been many “Sinterklaas intochten” (arrival of Saint Nicholas in the Netherlands) on board the SS Succes and the “Pakjesboot” has played a prominent role in commercials and feature films such as the Dutch film “Pak van Mijn Hart” (Reassurance). Saint Nicholas, his faithful horse Amerigo and all his helpers are, each year, always happy to climb aboard this beautiful steamer. 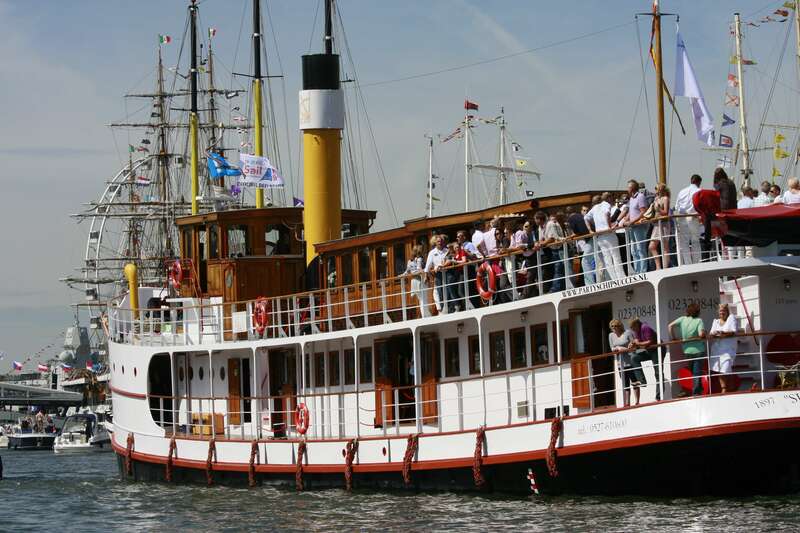 Would you like to hire the SS Succes and her famous steam organ for your “Sinterklaas intocht”? Please make a reservation in good time! The departure times of the SS Succes can be tailored to your wishes. You can choose an afternoon trip with High Tea and/or drinks served, or an evening trip with dinner and/or party night. Whole days can also be booked, with for instance trips to Pampus, the Zaanse Schans, Volendam or Marken. For the use of the organ the steam boiler has to be warmed up. To do this, we charge € 350. The listed rental prices include captain, deckhand, tourist tax and delivering on and off board of the catering, exclusive VAT. Additional costs are charged for the actual catering and service personnel. Standard departure harbour is Almere Haven. Costs for delivery to another port of departure from €150 (ex 6% VAT) per hour. You can find more information about the catering and service personnel on our catering overview. The SS Succes is berthed in Almere Haven. You can, however, embark or disembark at other locations. For example: close to Amsterdam Central Station, Amsterdam North, Zaandam, Muiden, Rotterdam etc. Are you in the mood for a party? Then we have a splendid location for you: SS Succes. A floating party palace, with all sorts of possibilities. It’s party time! A party and a boat is not always a combination everyone thinks of right away. But once you’ve done it, you won’t want anything else. An exclusive location for your guests and yourself, the freedom, the space around you …… on board the SS Succes, it’s just one big party! For the most special day of your life you also want to choose the most special location. 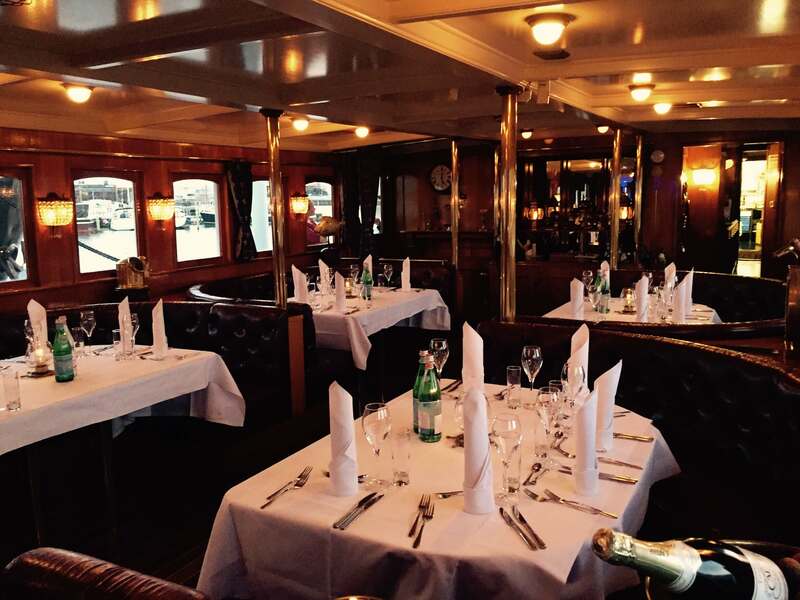 SS Succes is the perfect wedding boat with attractive accommodation for your entire wedding: from greeting your guests, to the ceremony, drinks, dinner and a party night. Say Yes I do? Saint Nicholas arrives from Spain every year and his mode of transport is a steamer. This has been so for one hundred and seventy years and it will remain so. Do you want to organise your own arrival of Saint Nicholas over the water? Choose the SS Succes, an original “Pakjesboot”! 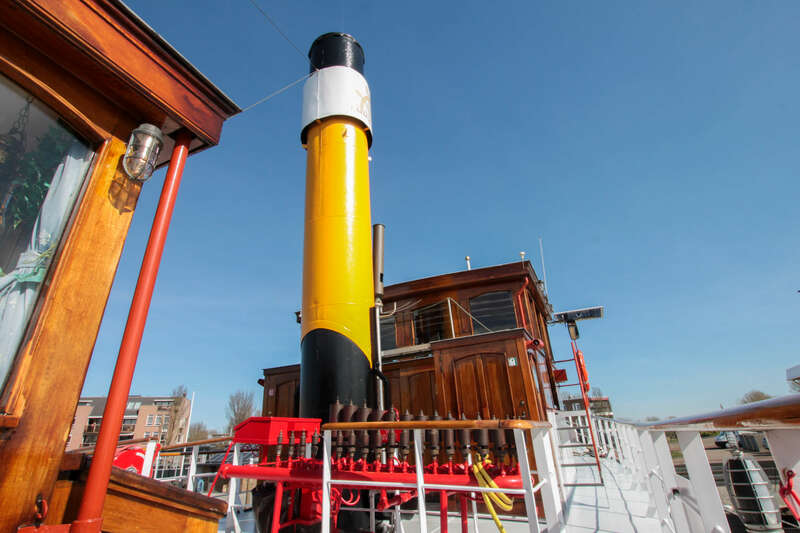 Are you longing to climb aboard a steam ship and make it a trip to remember? Venture out with SS Success. This classic salon steamer makes every trip a great experience! A barbecue experience on board SS Succes? During a trip on the IJmeer or the Markermeer our kitchen staff will prepare the most delicious snacks. In the mood for a Satay skewer with peanut sauce? A Hamburger? We are at your service! Are you planning a cruise in Amsterdam for a large number of guests? Would you like it to be on a stylish ship with enough options to make it a memorable experience? Choose the luxurious SS Succes! Do you want to leave everything behind you and just have fun? We do too! And we have the right ship for it: SS Succes. A luxurious salon steamer with all the space you need to satisfy your needs. An event on a boat already has that something extra. It attracts more attention and more visitors. If you choose the SS Succes, you may have a busier event than you ever dreamed of. Lower the gangway! Want to get married in style? Combine the distinct atmosphere of our capital city with the classic ambience of the SS Succes. On board this luxurious, salon steamer you will find yourself in a whole other world. And you won’t be doing it alone; we have room for well over a hundred guests! Personnel and colleagues all together on board? Every company should do it! It’s a great opportunity to talk informally and catch up with each other. Not to mention the wonderful views and the joy of a boat trip. Good for team spirit!